The main opposition party in India, the Bharatiya Janata Party (B.J.P. ), besides struggling to come out of the shock of defeat in recent general elections, is now facing another problem. The Party called a three-day "chintan baithak" (brainstorming session) in the hill station of Shimla to discuss the causes of defeat in the general elections and plan future strategy. The discussion on the causes of defeat was yet to start when, on the very first day of the session, Party President Rajnath Singh announced a decision of the party's parliamentary board to the media. He declared that the Party's primary membership of former Cabinet Minister Jaswant Singh had been terminated. This "reward" is for his recently published book, "Jinnah: India-Partition Independence," in which Jaswant Singh describes the founder of Pakistan, Mohammad Ali Jinnah, as secular. Simultaneously he allegedly tried to hold India's first Home Minister, Sardar Vallabh Bhai Patel, responsible for the partition. Jaswant Singh is seeing his expulsion as an attack on the freedom of expression. According to the Party, the contents of the book constitute an act of extreme discipline and deviation from the Party's "core beliefs." The Narendra Modi government of Gujarat has banned the sale of the book in the state. The B.J.P. 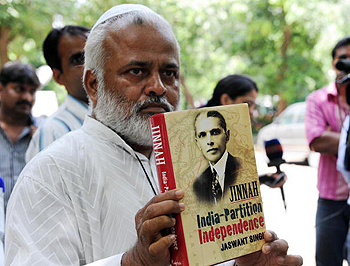 is of the view that Jinnah alone was responsible for the partition on communal lines. The Party feels that Patel was not at all responsible for the partition and that he, in fact, performed the difficult task of uniting the country post-independence. After expulsion, Jaswant Singh has reminded the B.J.P. that it was Sardar Patel who first banned the Rashtriya Swayamsevak Sangh (R.S.S.) in the aftermath of Mahatma's assassination. By saying that, Jaswant Singh tried to convey that Patel certainly took many steps to keep the nation united and that banning the R.S.S. was one of those steps. But the B.J.P. leaders don't have the mettle to support such steps. Either it is the B.J.P. or its patron, the so-called social and nationalist organization, R.S.S.—or the V.H.P. or other sister organizations—they have always refused to read the writing on the wall. In the "chintan baithak" in Shimla, the B.J.P. tried to hide or veil a report that was prepared to analyze the reasons behind the party’s poll defeat. The report clearly indicted the party leadership on many fronts, and this is the reason why the report is not acceptable to it. Notwithstanding the leakage of report to the media, senior leaders like Lal Krishna Advani tried to act as if there was no such report. And while party leadership was hesitant to make the report public, media repeatedly displayed the 41-page report on television, debating the points argued within. One of the reasons of defeat mentioned in the report is the projection of Narendra Modi as P.M. candidate amidst election. The second reason is said to be the personal attack on Prime Minister Manmohan Singh, which people didn't like. It means that Advani's rhetoric of "weak P.M." didn't go down well with the public. A third factor is Varun Gandhi's venomous speech and Party support for him. Another reason was that the B.J.P. failed to corner Congress on the 26/11 Mumbai attack. Instead, the Congress fired back with the Kandahar plane hijack issue. Apart from these points, there were other factors mentioned in the report that the party leadership has tried to hide from the public. The report indicted the policy makers of the Party—Lal Krishna Advani, Arun Jaitely and Narendra Modi—though without stating names. It is also mentioned that the slogans, plans and promises given by the Party were also behind the defeat. But the B.J.P. leadership is still trying to avoid the truth. All this is not done by the leadership involuntarily, though. A long-term strategy of the R.S.S. is working behind it. It is well known that the R.S.S. and the B.J.P. are like two sides of the same coin. To legitimize its infiltration in government institutions and departments, Sangh has metamorphosed itself as a social and nationalist organization, while it has the B.J.P. on the front lines as its political organization. B.J.P. leadership can never dream of working contrary to Sangh's ideology. The media has usually accused Sangh and its sister organizations for most of the communal tensions in the country. The R.S.S. represents the ideology of extreme "Hindutva" and the B.J.P. is supposed to act on its directions. Whenever Rajnath Singh expresses his love for the ideology of "Hindutva," his party presidency becomes safer. On the other side, when Jaswant Singh seems to be inconsistent with the ideology, he is shown the way out. The question is whether the B.J.P. will continue to act as a toy in the hands of the R.S.S. or if it will try to understand the real grievances of progressive and peaceful people in the country. It is essential for the survival of the B.J.P. that it free itself from the clutches of communal forces. Otherwise it will continue to ignore the writing on the wall.